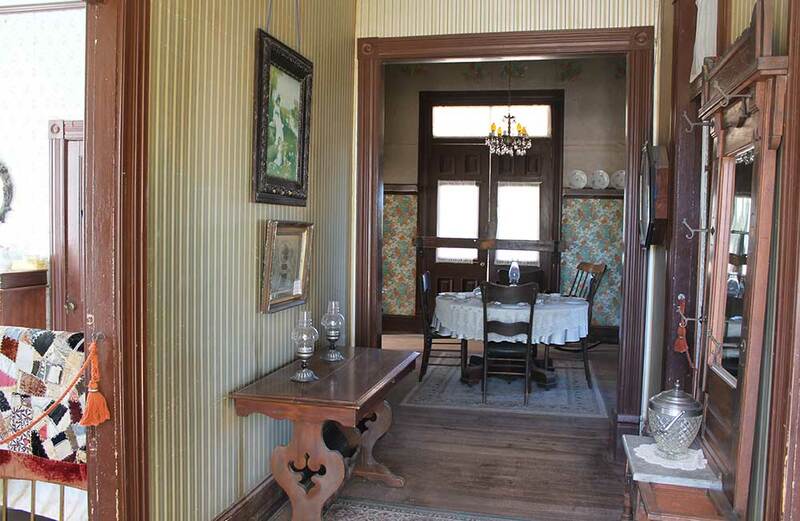 This house was built in the early 1890’s on an 80-acre homestead in Phoenix which was acquired by John Marion Sears. The grounds included orchards of apples, peaches, apricots, pears, figs, and almonds as well as a pump house and a windmill. In addition to the orchard, the Sears maintained a dairy. Sears lived here with his wife Mary and their daughter, Ella, and two sons, Perry and George. 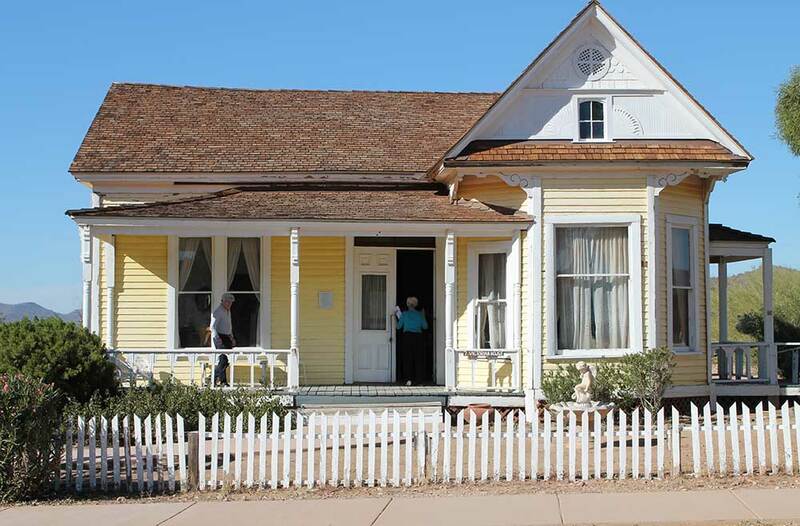 Originally located at 4032 North Seventh Street, the property lines fronted Central Avenue extending from Thomas to Indian School Road. Before Phoenix developed a railroad connection in 1887, the transportation of lumber was dependent upon expensive freight-wagon shipping. Therefore, most buildings in the Phoenix area were built of adobe bricks. When the railroad made the shipment of lumber for building more affordable, there was a boom in building. 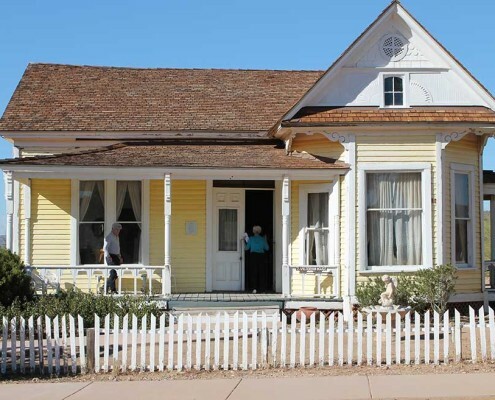 This house was among the earliest total frame houses in Phoenix. In May of 1969, the Sears home was scheduled for demolition in 30 days. It was donated to Pioneer Arizona and the Foundation scrambled to raise the $5,000 needed to move it to the museum grounds. During restoration, a section of the original wallpaper was discovered beneath the dining room plate-rail. 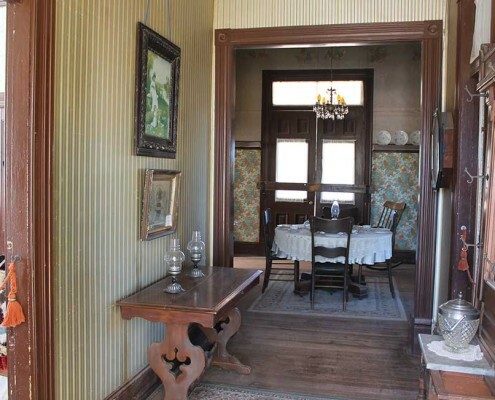 This exhibit is not meant to represent the Sears home or their furnishings when they lived there, but rather depicts a typical 1890’s middle class Phoenix dwelling with a parlor, music room, kitchen, and two bedrooms. J. Marion Sears was born in Jackson County, Missouri on October 26, 1843, the son of Nathan and Nancy (Mills) Sears of Kentucky. He was a veteran of the Confederate Army and came to Arizona in 1878 at the age of 35 and subsequently spent 52 continuous years in the cattle ranching business. He died at the age of 94 in 1937. Besides delivering several hundred cattle to the Verde River upon his arrival in 1878, Mr. Sears was also a freighter and a homesteader.